If your children love the funny stories by Andy Griffiths and the Tom Gate series they will enjoy this book. Weirdo is written by a nine year old junior author from New Zealand who can't stop writing! Inspired by his favourite books, Ben started writing to entertain his peers with an authentic voice only a child can have. Weirdo is a story about a boy who recently lost his parents. He now lives by himself. He has no friends at school and everyone thinks he is weird... Well, there are some pretty weird things he does sometimes! But can Ugine be happy again? Join him on this funny, weird adventure and find out! 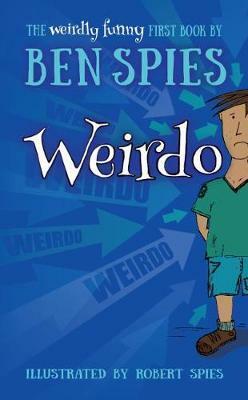 Weirdo has recently been reviewed by the assistant librarian at Balmoral School. Anita was blown away by Ben's language, imagination and sense of humour. "For example, to shake off the boss poacher who's hanging off their escape helicopter, Ben sings a horrible song on loop until the poacher drops off with the torture of it. Everyday speech packed with dialogue propels the action (Quick, swing! Take cover!) Ben uses present tense to heighten the reality, and there are jokes and laughs on every page. "Claire hits Max where it really hurts for a boy..."
Ben was interviewed by the Kapiti Now and they too were fascinated by Ben's passion to write and create stories for his peers to enjoy. "Most books written for children are authored by adults, the true point of difference in Ben's books is that they are written by a child, for children. Through a child's eyes, and with a child's voice. The irreverent humour and story-telling from a young person's perspective mean that these books really speak to their audience in an authentic tone that they understand and enjoy."